The very same principal is applicable to credit cards. When used judiciously credit cards can help you build and improve your CIBIL score, but the moment you go reckless with them, you are inviting a potential debt trap. You have been told from your childhood that fire is a good servant but a bad master and that’s why you have always handled fire with caution. The very same principal is applicable to credit cards. When used judiciously credit cards can help you build and improve your CIBIL score, but the moment you go reckless with them, you are inviting a potential debt trap. While you have the option of choosing from among a plethora of cards that can be used for various purposes, a store credit card is not a good idea, even though you are tempted with extra “savings” of 10% on your purchase or a 5% cash back or a “sign on bonus”. Here are four reasons why you should say no to offers of credit cards from retail outfits. When you choose a credit card carefully comparing things like fees, interest rates and rewards that are best suited to your purpose, you can end up with a card that offers an interest rate of 15-16% as against store credit cards where interest rates hover around 20-23 % on an average. Besides the reward points are limited to the store offers and try to veer the customer towards making more purchases from the store. Someone who has a penchant for shopping can fall into such a trap easily and soon rack up debt that becomes impossible to pay off in a short period of time. Do not think that just because the store or a retail outfit is offering you a credit card upfront, there are no inquiries on the same. Just like a regular credit card issuer, a store branded credit card will look into your CIBIL report before you are handed over the card and a hard inquiry on its account will bring down your CIBIL score by a tad. 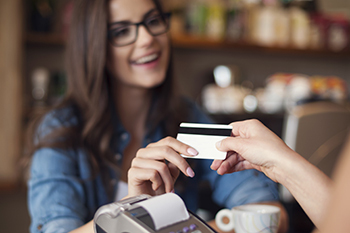 Store credit cards have lower limits as compared to regular credit cards. While you may think it is a good things as it will keep you from overspending, but it has another side effect that you may have overlooked. Spending too much on your store linked credit card will increase your credit utilisation, or the total amount of credit you spend as against the total credit made available to you. Once again, high credit utilisation is detrimental to your CIBIL score. In order to maintain a good CIBIL score, your credit utilisation should not exceed 30-40%. Most people use credit cards that are linked to their bank accounts, so every time one logs into his banking account online he sees the details of his credit usage on his cards and makes a mental note of the repayment. If you are a user of multiple credit cards, a store credit card may get buried unintentionally, and then out of the blue you are hit with a hefty bill with late payment or even default charges et all. Not only do you land yourself in a debt trap but late payment or non-payment of your dues will be a huge drag on your CIBIL score. However, it is only fair to say that a store credit card may not be as evil if you are a master manager of credit and can juggle multiple cards with ease. Else, if you are a first time credit user and are looking for an opportunity to build a good track record that will show you in good light on your CIBIL report, a store card may be a perfect solution for you. If you qualify under neither of these heads, you are better off without a store credit card. If savings is what your primary concern is, pick as credit card that offers you a cash back on every purchase across retail chains in India. Although a single cashback may not seem like a lot, you will end up saving quite a bit over the long run.